What’s a dog to do? It’s a nine-hour drive from Indianapolis to home, the skies are gray with rain and the humans are dieting again after their vacation. So, without the need for begging, the rhythmic slapping of the windshield wipers are hard to resist. 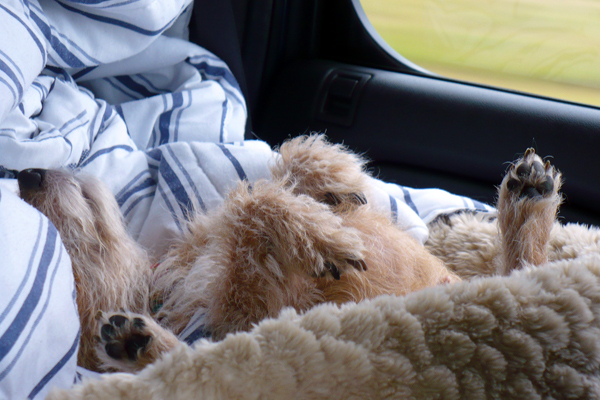 Peppermint found the perfect position during the drive home, her dog bed and comforter providing the perfect backdrop to a day of lazing around and watching the world go by. Well, there wasn’t much watching, to be honest. After a tough three days as a guest in the house of the Golden retriever Sam and the mixed breed Zoe (where they ruled the roost), Peppermint was ready for a day of recovery. She slept nearly the entire trip, waking for a few brief walk breaks and a snack. So she’s all rested for tomorrow, where it’s back to reality. Oh yeah, that just means it’s the couch instead of the Tahoe. This made me laugh, Tricia! What a sweetie! Yes, she always makes me smile when I see her sleeping this way! Glad it worked for you, too! Ah, that is my kind of dog’s life–naps galore! Seriously, I don’t know how I make it through the day without a nap when she sleeps the day away right behind me! What an absolutely wonderful photo! Thank you Nia! Peppermint likes to sleep in the car. She might watch out the window for 10 or 15 minutes, but after that she’s sound asleep. She is a wonderful traveler!